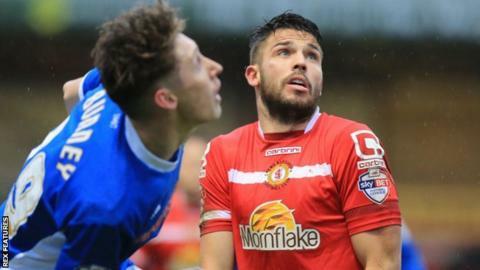 Crewe extended their unbeaten run to four games by beating Rochdale to move within three points of safety. They took the lead when George Cooper's corner was not dealt with by Dale and Marcus Haber prodded home. Brad Inman doubled the advantage on the stroke of half-time when he tackled Peter Vincenti in the centre circle and drove forward before striking home. Ian Henderson should have reduced the deficit, but he drove across the face of goal when free in the box. Crewe rise a place to 22nd after their first win in over two months. "When the lads play like that it's hard to think why we've only won three home games this season. It was a great three points. We deserved it. "I've been onto the players all week that we've not done well enough at home. I've told them we need to start winning at home and if we can do that and win the majority of them then we have a chance of doing it. "It was nice to score from a set-play. Ben Nugent made a run to the near post. It put a couple of their players off and Marcus has pulled off at the far post. And Brad's goal was fantastic. He has terrific pace. When he is in that mood then he is very hard to stop." "Unfortunately, defensively we made bad decisions and that's hurt us. It's difficult because you tend to forgive strikers for missing opportunities more than you do defenders for giving away opportunities. "Crewe have taken advantage of our friendly nature today - we were very charitable. "Defensively, I was found a little bit wanting and that's a concern. Even though we've won two of the last five games, within those we've conceded 12 goals." Match ends, Crewe Alexandra 2, Rochdale 0. Second Half ends, Crewe Alexandra 2, Rochdale 0. Corner, Rochdale. Conceded by Oliver Turton. Corner, Rochdale. Conceded by Ben Nugent. Substitution, Crewe Alexandra. Joe Howell replaces Ryan Seager. Corner, Rochdale. Conceded by Perry Ng. Attempt saved. Ian Henderson (Rochdale) right footed shot from the centre of the box is saved in the centre of the goal. Substitution, Crewe Alexandra. Perry Ng replaces Bradden Inman. Corner, Crewe Alexandra. Conceded by Oliver Lancashire. Corner, Crewe Alexandra. Conceded by Jimmy McNulty. Substitution, Rochdale. Nathaniel Mendez-Laing replaces David Syers. Attempt missed. David Syers (Rochdale) left footed shot from the centre of the box is close, but misses to the left. Corner, Rochdale. Conceded by Semi Ajayi. Substitution, Crewe Alexandra. Zoumana Bakayogo replaces George Cooper. Substitution, Rochdale. Joe Bunney replaces Tom Kennedy. Attempt missed. Ian Henderson (Rochdale) right footed shot from the centre of the box is high and wide to the right. Attempt blocked. Ian Henderson (Rochdale) left footed shot from the left side of the box is blocked. Attempt saved. Jamie Allen (Rochdale) right footed shot from outside the box is saved in the top centre of the goal. Corner, Crewe Alexandra. Conceded by Josh Lillis. Attempt missed. Marcus Haber (Crewe Alexandra) header from the centre of the box is close, but misses to the left. Attempt saved. David Syers (Rochdale) right footed shot from outside the box is saved in the centre of the goal. Attempt saved. George Cooper (Crewe Alexandra) right footed shot from outside the box is saved in the centre of the goal. Bradden Inman (Crewe Alexandra) wins a free kick on the right wing.